Let us go now where the beer flows like wine, and the cider flows like … champagne, it turns out. We’re taking a look at the top three places to imbibe cider in a place where beautiful women instinctively flock like the salmon of Capistrano—a little place called Aspen. Element 47, located within The Little Nell hotel (just steps from the Silver Queen Gondola), is Aspen’s only 5-star restaurant. 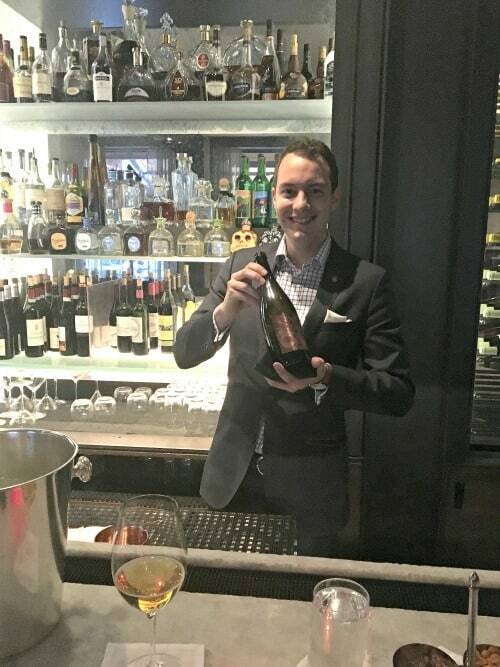 Upon arrival at the modern, elegant bar area, customers are handed an embossed menu filled with an exquisitely curated wine list. It seems a place where cider might be overlooked. Hops Culture, or just “Hops,” attracts a following for its extensive beer menu. 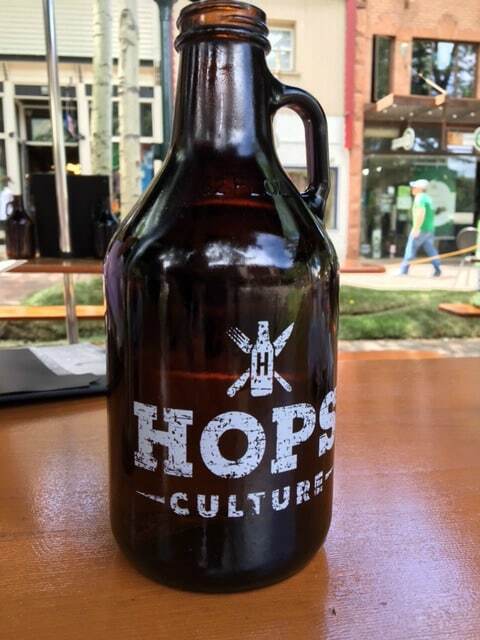 Set in the heart of the small village of Aspen on a quaint pedestrian-only street, Hops is the perfect spot for people watching (and being watched). Hops acknowledges hard cider with its inclusion of two ciders on draft and eight ciders on its bottle beer menu. Customers will enjoy the rustic and charming patios and outdoor bar stools set against the open air bar with sporting events on the indoor TVs. During our visit, we tried the Boondocker (6.9% ABV) from Snow Capped Cider of Cedaredge, Colorado. Served in a small flight glass, it appeared cloudy and muddy-straw in color, with slight sparkling to none. It may not be most visually attractive cider, yet on the palate it is excellent: sour lime notes, very dry, faint hops. The bitterness is light and pleasant. Then there is the aftertaste: astringent, floral and refreshing. Tastes like more. At J-Bar in Hotel Jerome, our waitress, Louise Evans, was the main attraction in that loving, loud and bossy way that folks from remote St. John’s, Newfoundland, Canada, can be. J-Bar is on this list because it is a not-to-be-missed historical stop for any thirsty tourist. Waitress Louise served the only cider on the menu, Possmann Pure Cider, with enthusiastic instructions on the correct way to taste it. “Try it first from the bottle. Go ahead, try it. Try it!” We did so, under duress—no time for sniffing aromas. It was heavy, sweet and almost syrupy. 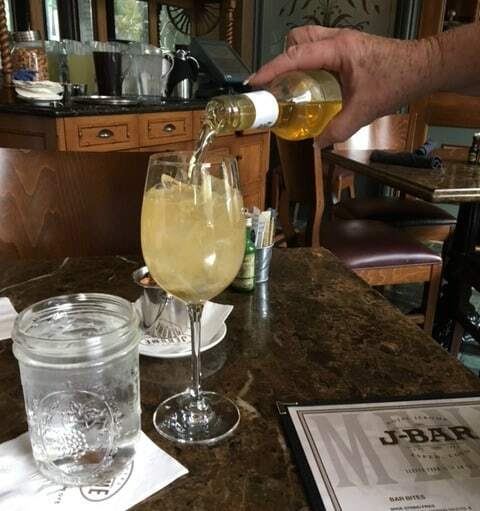 She briefly recounted her history with cider: “I learned to taste cider from a Spaniard.” She then poured the cider over ice into a long-stemmed wine glass. It was vigorously effervescent for a moment. “Try it now,” she commanded. We did and discovered a much lighter-bodied effect. “It really opens up, doesn’t it?” said Louise. We agreed. The bubbling quickly subsided, leaving a light, sweet ripe apple flavor. The color was pure straw-grass. The cider comes from Frankfurt, Germany, and is consistent in character with other ciders from the region. There were notes of pear and sweet-churned butter. The 5% ABV came through very subtly. So much more than a posh ski destination, Aspen did not disappoint. It’s sporty, exotic and still surprisingly sweet, low-key and natural in a way that soothes the spirit. Cider lovers are more than welcome. So grab your best friend, hop on a scooter and head for the hills. Captured me from the first sentence to the last word..brat and sauerkraut had me also.